I set up my first weaving studio at Pullens Yards, when I graduated from the Royal College of Art, with a group of fellow students. It was the perfect place to be as a young weaver, surrounded by other makers in a place that had such long history of proffessional crafts. Coming back to take part in Open Studios, always feels a bit like coming home, its inspiring to meet up with the other makers again and always enjoyable to meet returning and new visitor. My projects have taken me on many adventures, such as Paris, were I collaborated on setting up a design studio, creating fashion and furnishing fabrics. Then later wanting a bigger scale, came back to London to work with interior designers and architects, creating large scale textile pieces, from castles in Switzerland to shop interiors in Japan. My experience as a weaver has taken me to work on projects with Bedouin women in Egypt, artisans in Ethiopia and more recently makers in Kenya. I have shared these projects and adventures with students, as a visiting lecturer, at Central St Martins, Goldsmiths College of Art and the Royal College of Art, and am currently running workshops at The Weaving Shed in Stroud. Limited edition Shetland blankets 12 checks and 12 stripes 190 x 160 cm £120. 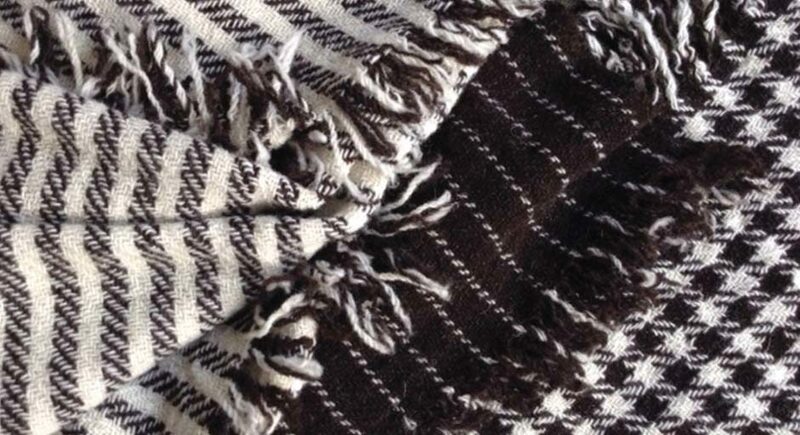 Welsh Black Mountain and Jacob blanket/shawls £120. My latest weaving collection takes you into the heart of the British landscape, using 100% pure Shetland wool gathered in from the local crofters, spun and dyed at a family run mill, then woven into blankets. My shawls and scarves are woven in the natural colours from the fleeces of Welsh Black Mountain and Jacob sheep and I continue to hand weave smaller items in lambswool.